Until the boundary changed in 1987 (under the East Northamptonshire (Parishes) order 1987), a strip of the parish, one field wide, that ran from the edge of the village down to the River Nene, between the parishes of Higham Ferrers and Stanwick. Both the former Fitzwilliam Arms and the railway station were situated here by the river. Site of the station on the 1919 estate sale plan. Images courtesy of the Irthlingborough Photographic Archive. 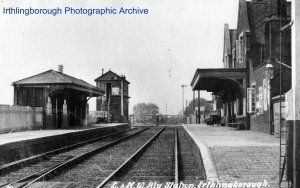 It was opened as Higham Ferrers station in June 1845, being one of 12 stations on the London & Birmingham Railway's new link from Blisworth (near Northampton) to Peterborough along the Nene Valley. 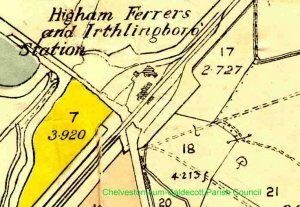 The station was renamed Higham Ferrers and Irthlingborough in April 1885 and finally Irthlingborough in October 1910. LNWR became part of the London Midland & Scottish (LMS) in 1923, which in turn was nationalised into part of the British Railways (BR) in 1948. The station closed to passenger traffic in May 1964 and freight in June 1966. BR finally closed the line to through traffic in 1972. Located on the site was a ramp to allow horse drawn carts to tip mineral ore from the nearby Chelveston quarries into the railway wagons for transport to the furnaces at Wellingborough. 1851 Clerk John Perci Jarrett. 1861 Railway Agent John Green. 1906 Stationmaster Charles S Gill.